Copy worksheet method in VBA is used to Copy the worksheet from one location to another location in the same workbook or another new workbook or existing workbook. Why we use Copy Worksheet using VBA? When we use Copy Worksheet method in VBA? If we want to Copy worksheet from one workbook to another existing workbook or new workbook we will use Copy method of worksheet object. Sometimes we may want to Copy worksheet in the active workbook at the beginning of the worksheet or in between worksheets or at the end of worksheet. 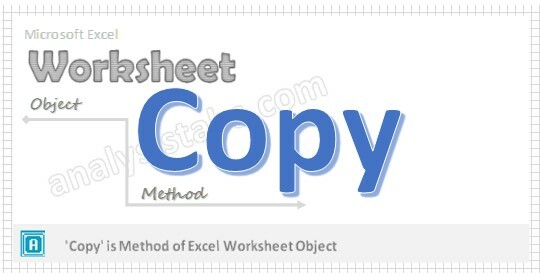 According to our requirement we can Copy the worksheets using Copy worksheet method in VBA. Here is the syntax to Copy Worksheet using VBA. Before: It’s an Optional parameter. The worksheet will be Copied to before the specified worksheet. Then we can’t specify after parameter. After: It’s an Optional parameter. The worksheet will be Copied to after the specified worksheet. Then we can’t specify after parameter. In the above Syntax Worksheet represents object and Copy represents metod of Worksheet Object. Please find the below example, It will show you how to Copy the Worksheet to the beginning. In the above example we are Copying the Worksheet named ‘Sheet3’ to the beginning of the worksheet. Where ‘1’ represents the Worksheet index number (Nothing but first available sheet in the workbook). In the above example we are Copying the active worksheet to the beginning of the worksheet. Please find the below example, It will show you how to Copy the Worksheet at the end of the available worksheets. In the above example we are Copying the active worksheet to the end of the worksheet. Press ‘F5’ to run it or Keep Pressing ‘F8’ to debug the code line by line and check how the Worksheet copied .